About a month ago at work, I was trying out a bunch of different performance-testing tools to figure out which one to use to performance-test our software. I ended up discovering a tool called The Grinder which uses Jython to build performance-testing scripts that you can then use to test your application. I even built a little framework in Jython to make the test scripts more modular and reusable. Over the next few days I’ll be publishing three articles (this one included) that talk about Grinder. In this article I’ll go over installing and setting up Grinder. I am not going to go into too many details since my aim is to provide information that will enable you to have Grinder up and running quickly. If you want more information, you can look at the rather thorough Grinder User Guide. At the end of this guide, you’ll know how to install and set up grinder, record a test, modify (and/or parameterize) it, start running it through the console, and record data from the test. Note: The instructions in this guide relate to a Linux environment. You can run Grinder in Windows; the set-up is not much different. The only differences will be in installation locations and shell scripts. If you want more information about setting up Grinder in a Windows environment, please take a look here. First you need to download Grinder. You can get it from here. You should only need to download the binary distribution and not the source distribution (unless you’re planning on extending Grinder). Unzip the installation file to somewhere convenient. I extracted the file to /usr/local/grinder. I recommend chown‘ing the installation directory to yourusername:yourusername. Make sure that your version of the JDK is greater than or equal to 1.4, otherwise Grinder won’t work! The second thing you need to install is Jython. Note that this is not absolutely necessary, but I found it useful to have around when I was trying to parameterize the test-scripts, and I needed to test something out first. I recommend not using the Jython that comes with Ubuntu. Instead, download and install Jython 2.2.1 from here (there are issues with Jython 2.5 and Grinder). As you can see, you essentially have a console that sits on top of everything. It acts like a controller, pushing out scenarios and test cases (scripts) to agents that are running on load-injection machines. Each agent is in charge of one or more workers that inject load into the system you are testing. The workers also report data back to the console. 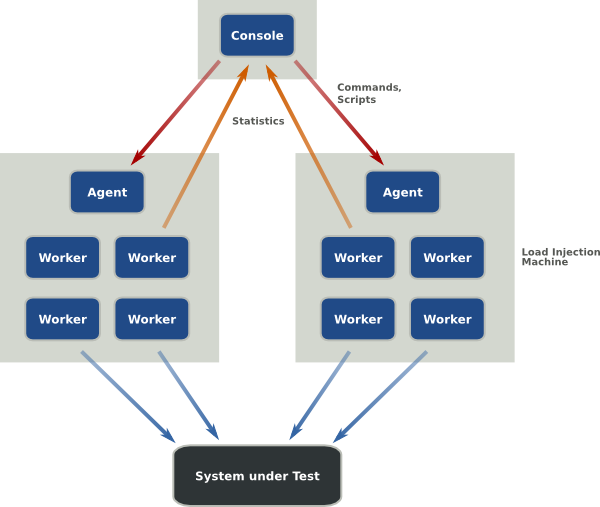 The console aggregates all the data it receives from the workers and presents it to you. This is the ideal scenario that you would use for actual performance testing, however like I said before, I’m not going to concentrate on that – I’m just going to show you how to quickly set up Grinder and run a performance test on your local machine. If you want to look into distributing scenarios and tests across different agents, you can take a look here. # a test. Jython caches imports and so you need to let it know where it can store the imports. # Here you set up the arguments that tells the agent where the console lives. If you want more information regarding the grinder.properties file, take a look at this page. Alright, now that you have the grinder.properties created, you also need a few shell-scripts to easily start and stop the console, agent, and TCP Proxy. You will have to change the values of GRINDERPATH, GRINDERPROPERTIES, and JAVA_HOME to values that make sense on your system. Before you start performance testing, you need to have a test. Grinder test scripts are written in the Jython language. You can write your tests from scratch if you wish (it can be useful if you’re trying to test things like XML-RPC), but more often than not you will be using Grinder’s proxy tool to record a usage scenario and generate a test script. The tool that Grinder comes with is called TCP Proxy. It sits between the browser and the server and records requests and responses that move between the browser and the server. By itself, it simply echoes whatever goes through it (in that sense, it makes a pretty good debugging tool), but we want it to generate Jython test scripts. Note: TCPProxy actually uses XSLT to translate the header information into a Jython script. This is pretty neat, actually because you can use XSLT to translate the code to Groovy, or even JRuby. First, you need to start up TCP Proxy. Simply run startProxy.sh and you should be good to go. A little window will pop-up letting you know that the proxy is running. There’s a textbox in the window that lets you insert comments too. Once you the proxy is started up, you need to configure your browser to use the proxy at localhost:8001. Now access the app you want to test, in your browser. Log in and do whatever it is you need to do (search for a contact, add a contact, send and email, etc.). In the scenario I created, I logged in, searched for contacts, added a new contact, searched for more contacts, and then logged out. Note: If you get an alert box that complains about security certificates, you can add an exception in Firefox by going to Edit->Preferences->Advanced->Encryption Tab->View Certificates->Add Exception. Put in the URL to your server and Firefox should grab the certificate and add an exception. Once you’re done recording the test, press the Stop button in TCPProxy. # To use a proxy server, uncomment the next line and set the host and port. # when the worker process is started. # reference to the HTTPRequest with an instrumented version. # You can access the unadorned instance using request101.__target__. """A TestRunner instance is created for each worker thread.""" # A method for each recorded page. """This method is called for every run performed by the worker thread.""" """Instrument a method with the given Test.""" # Replace each method with an instrumented version. # You can call the unadorned method using self.page1.__target__(). To parameterize logins, I created an array of dictionaries that store username and password combinations. Then, based on the thread number (which is zero-based and which I can access via grinder.threadNumber) I select the appropriate username and password combination, to log in. If you check back into the Grinder console, you can see that it is grabbing data from the agent. Now just sit back and let the test run. Once the test is complete, hit the stop button and exit out of console. If you go to the directory from where you started up the agent, you will see three log files: data_<hostname>-N.log, error_<hostname>-N.log, and out_<hostname>-N.log. data_<hostname>-N.log is the file that contains all the data gathered (like mean response time, transactions per second, etc.). It is a comma-separated-values file and you can open it up in Excel or Openoffice Calc. error_<hostname>-N.log contains any errors encountered while running the test, and out_<hostname>-N.log contains logging data from the script file. You are now in a position to analyze data from the log files. WARNING: I recommend NOT using the version of Java that comes with Ubuntu (GCJ/IcedTea or whatever). Instead, use Sun’s Java6. I ran into a whole bunch of problems and wasted an entire day (you can view the thread describing the problem here). Grinder spits out raw data. So it’s not that user-friendly when compared to, say, WebLoad. This makes sense when you consider the fact that Grinder is geared towards developers. Grinder says “Here is the data I collected, do whatever you want with it”. If you want a quick overview of your performance data, there is a tool called GrinderAnalyzer that you can download from here. Usage is pretty straightfoward (check out the documentation). Extract it to your user home directory. Then run the shell script (run.sh) in the bin directory while providing it your data_<hostname>-N.log and out_<hostname>-N.log files. GrinderAnalyzer will generate some pretty graphs and some pretty tables for you to view. Your other option is to examine the data on your own and generate graphs. This, while a bit more involved, gives you the freedom to display the data in a manner you see fit. Grinder is a pretty flexible and powerful performance-testing tool. I’m hoping that after this tutorial you have enough knowledge to go out and start creating and running tests of your own. Like I mentioned before, this guide is by no meand comprehensive. It’s simply something to get you started. If you want more information, I highly recommend looking at the excellent Grinder Documentation. Its really great article. Thank you so much for sharing these details. I just started exploring grinder for performance testing. Your article is really great help for parametrization in test script. Hi – thanks very much for this – am currently evaluating grinder and this was by far the best quickstart guide I could find! Quick question if you have a moment – I just want to confirm, but unlike other ‘commercial’ load test tool offerings that can dynamically parse a standard html page response then retrieve the page resources automatically (jpg, css etc), these all have to written as individual requests in the grinder so if the page images change then these have to be re-recorded or at least re-scripted? I believe the answer is yes, this is the case and if you wanted to do this you’d have to write custom scripting to parse the HTTPResponse text, but just want to get your thoughts on this – thanks! Thanks! I’m glad you like the guide! If I understand your question, you’re wondering if you’d have to re-record or re-script the test if your resources change. The answer is ‘yes’. But I would think that you’d have to do the same thing for commercial load-testing software as well (if page names change, for example). But you’re correct about parsing the response. A Grinder script simply hits a URL (and may send POST or GET data) and doesn’t go through the response text. I think the difference is in the way Grinder is structured; it has two independent phases. In the recording phase, Grinder records everything, including page resources that are accessed when you hit a page. It seems that in some commercial load-testers, those phases are intertwined. So you simply provide a URL and then it parses the response that it gets. This would seem to remove the dependency on resources. I think it is possible to extend Grinder so that it displays the same behavior. Great – thanks for the response! Thought that was the case, and thanks for confirming. If I get a chance to extend to allow this behaviour, I’ll be sure to let you know. nice article to go through. i tried parameterizing my user login application as discussed above. It looks like a yyntax error of some sort, but I can’t see it from your code. Maybe you have some sort of syntax error earlier on? Thanks for your article. Just i want me to get clarified on settings in grinder.properties.Suppose I want to load test with two grinder scripts a.py and b.py simultaneously. So i assign two agents each for a script. I will be invoking these two agents from same console and each agent will have separate grinder.properties. So each will have separate grinder.properties. So could you please confirm if above is right way and how can i implement virtual users say count of 20 ?. And i also wan t know what will be difference in setting grinder.threads=1 and grinder.threads=2 while executing the script. This is very useful article for me as a first time Grinder load testing user. Very meaningful explanation. Good work. Thank you for the article. I am a newbie for grinder and was trying to get more understanding. I was able to record, but when I tried to play back I am keep getting error message below. Any suggestio will be appreciated! Excellent start-up for the new comers who interested in evaluating the grinder. Vivin can you help me out in using the external file as my parameter file, Is it possible with Grinder Tool. In brief : there is a excel sheet or text document which have the username,password. i want to call this file and pick the value sequentially for each iteration. I type in a wrong password, I will get a response back from the server ‘invalid user id or password’. it is possible to do grab it in grinder? Hi, can you share the web application of infusion test ?? We are trying to use this grinder tool in our Project I’m facing some problems while running the scripts in the tool.can you please help me on this. I am a new for Grinder, but your article is a big help. I want to say thank you so much for sharing your experience with us. 1. How do we verify that user is logged in? 2. I am encountering the error message “no module named os” in grinder analyzer. Can you provide some input.